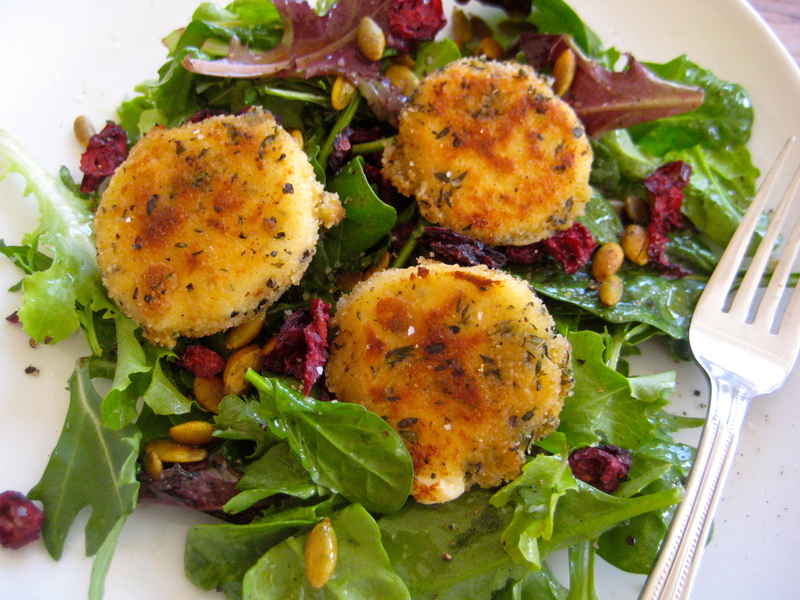 Baked (or, more often, fried) goat cheese salads are something I frequently order at restaurants, but never pulled off correctly at home. I usually tried to pan-fry the disks of lemony goat cheese, which resulted in them falling apart and burning in places. Then I looked through one of my old Cooks Illustrated magazines and found their perfect recipe for baked goat cheese salad. Aha, you have to freeze the goat cheese before baking (or frying) it. And I must say that the baking method is much easier, less mess and more tasty than anything fried on your stove top (or Fry Daddy). I adapted the recipe based on what I had at home and used a salad dressing I had left over from this recipe. I added dried cranberries and some pumpkin seeds that Grant had roasted with sesame and soy. Quite a tasty combination! Cut goat cheese into 1/4-inch disks and roll disks into balls. Set aside. Whisk eggs with dijon in a small bowl. Set aside. Mix bread crumbs with thyme, large pinch of salt and 10 cracks of black pepper in a small bowl and set aside. When goat cheese is cold and firm, brush all over with olive oil and bake until crust is lightly golden brown and cheese is slightly soft, 7-9 min. 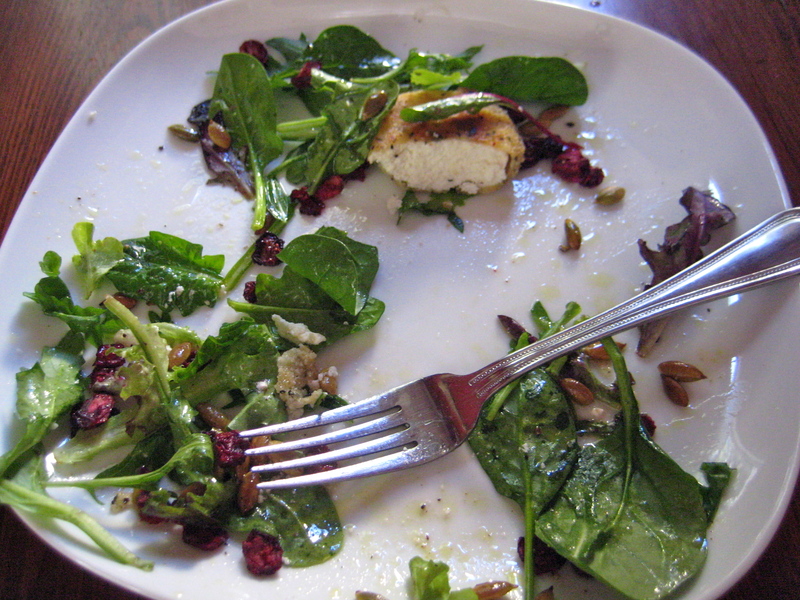 Meanwhile, toss salad mix with vinaigrette and sprinkle seeds and cranberries all over. When cheese is done, delicately remove to paper towels, then place on top of salad. The crust will be thin and crisp, perfectly holding the soft cheese inside. I love the lemony thyme flavoring the cheese. This was a deliciously light Friday dinner for us, perfect after a week of eating heavy foods. Enjoy as a meal or as a great starter salad when you have company over. 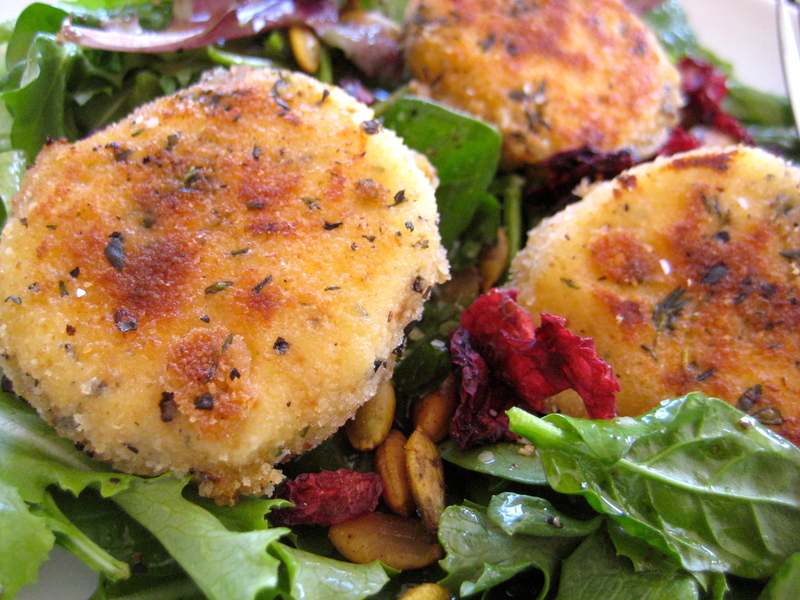 The goat cheese keeps well and you can just pan-fry it to heat it up the next day. Best served warm, of course, so the cheese can spread all over the salad. This entry was posted in Uncategorized and tagged Cooks Illustrated, cranberries, goat cheese, thyme, vinaigrette. Bookmark the permalink. You know, I think I’ll have you photograph all my food before I eat it. It’ll taste even better. Totally using this recipe as soon as I’m settled in my new place. I have my own new-home ritual meal whenever I move. Will this be yours? This reminds me of one of my all time favorite meals eaten on a sidewalk cafe in Paris. It is so simple and so delicious. We stopped here specifically for the salad and both ate it. Yum! I am a goat cheese nut! I too learned to freeze them after many a gooey disaster (still yummy).